Made-in-Vietnam products have been receiving more and more attention from the demanding market of Singapore. In the Vietnam Fair - Vivid Vietnam recently held in Singapore, a great variety and diversity of gastronomical delights were introduced to whet the appetites of local shoppers. Running from November 13 to 26, the event presented Vietnamese firms valuable opportunities to introduce their hi-quality products to the Merlion city state. Vietnamese rice, coffee, tea aquacultural products, are among the most sought-after. 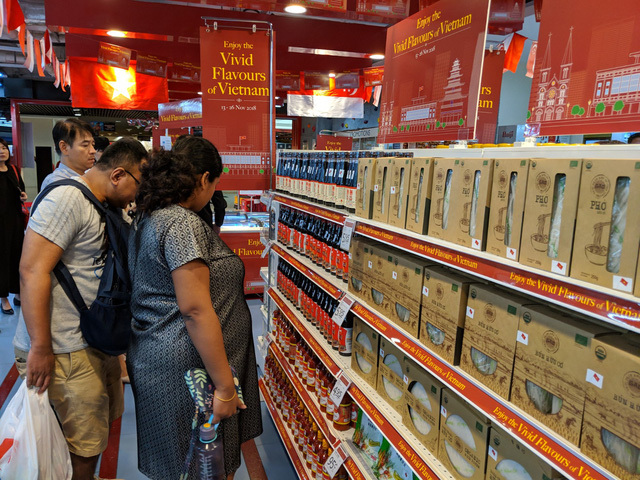 According to the New Paper, Since Vietnamese rice was introduced in 2007, its popularity has increased significantly year on year, and it currently makes up 20 per cent of total rice purchases at FairPrice. One of FairPrice Housebrand's best-sellers is the soft and aromatic FairPrice Housebrand Jasmine Fragrant Rice,which is made from 100 per cent whole kernel rice. For rice with a stickier texture, go for the FairPrice Housebrand Premium Short Grain Japonica Rice, which is available in 2.5kg packs, the site suggests. In addition to rice, The New Paper also gives many positive reviews about Vietnamese aquacultural products (prawn, catfish) and beverage (coffees, teas and milk). According to Nguyen Anh Duc, deputy general director of the Saigon Co.op, the leading Vietnamese retailer, his cooperative exported 200 containers of goods annually to Singapore. Most of them are agricultural products, such as catfish fillet, shrimp, sweet potato, green-skin pomelo, coconut Singaporean, and have been distributed by NTUC FairPrice’s stores. 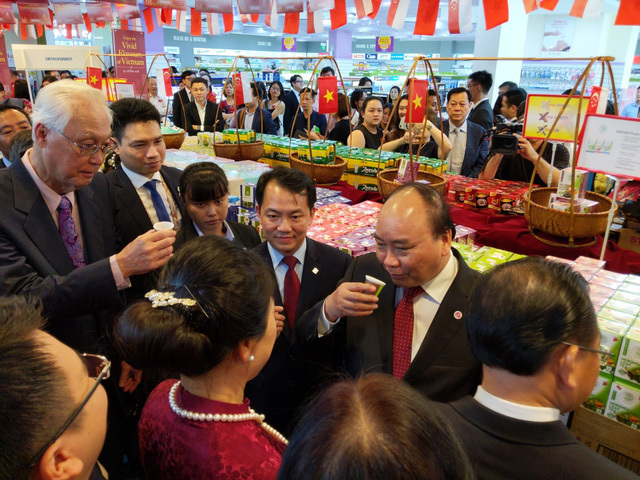 “The export has been increasing by 20 percent a year and is expected to top 2 million USD this year,” he said, noting that Vietnamese goods ranked fourth among Asia-Pacific products sold by NTUC FairPrice, which accounted for 56-60 percent of supermarket sales in Singapore. Vu Thi Thanh Hanh, general manager of the food & beverage company Learth Vietnam Co Ltd, sales of the firm’s VietJoy leaf tea products were very good three months after they entered the Singaporean market. Currently, VietJoy’s tea is available in NTUC Singapore in seven flavors: moringa leaf, guava leaf, mulberry leaf, soursop leaf, roselle flower, noni fruit, and graviola leaf. All of them are made of all-natural ingredients with no preservatives, colourants or additives added, she said. FairPrice now offers about 650 Vietnamese products in over 40 product categories, a 17 percent increase from 2015, he said. Seah Kim Peng, FairPrice’s CEO, stated that Vietnamese products, such as rice, seafood, and fresh fruits, have become more well known among Singaporean families. There have been positive achievements in the cooperation between FairPrice and Saigon Co.op, Peng continued, adding that the ties will continue flourishing in the future. According to the Ministry of Industry and Trade, Singapore is among Vietnam’s major trade partners, with bilateral trade going up from 7.1 billion USD in 2016 to 8.3 billion USD last year./.